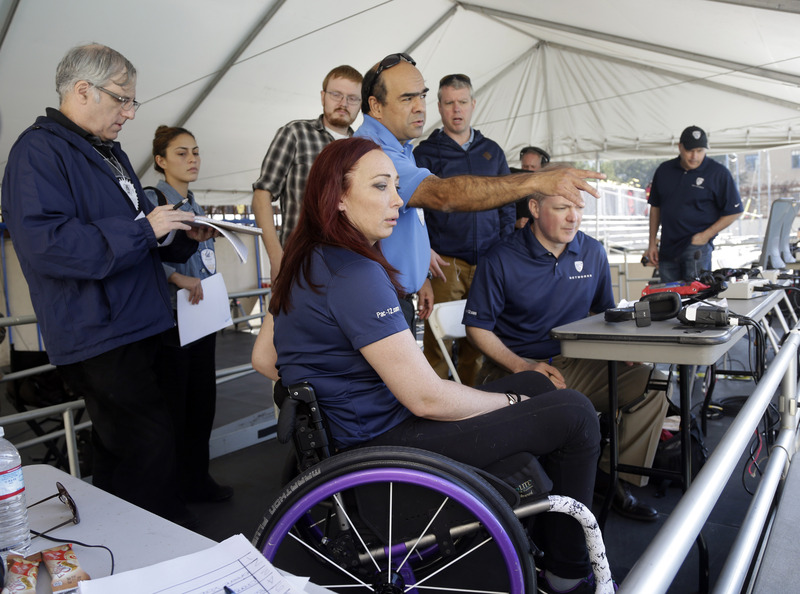 Six-time Olympic champion Amy Van Dyken Rouen made her return to the broadcast booth on Friday when she called the live telecast of No. 14 USC and No. 3 California for the Pac-12 Network. Van Dyken Rouen, who was paralyzed in an ATV accident last June, has been inspiring many people with her gung-ho attitude and belief she will walk again. Her legion of fans are now known as Amy’s Army. Van Dyken Rouen is also slated to call the Pac-12 Women’s Swimming Championships Feb. 25-28. Here’s a video by the Pac-12 Network featuring Van Dyken Rouen as well. 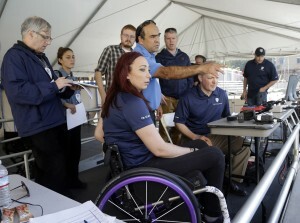 BERKELEY, Calif. — Amy Van Dyken pushed herself across one of Berkeley’s busy streets in her wheelchair and up a ramp into her special broadcast booth overlooking the pool deck, beaming the whole way. The six-time Olympic gold medal swimmer returned to work with the Pac-12 Networks on Friday, nearly eight months after an all-terrain vehicle accident left her paralyzed from the waist down. Van Dyken flew into the Bay Area from Arizona to call the USC-California women’s swim meet, and she figured it was a perfect return given there would be about a dozen potential Olympians — including Missy Franklin — in the pool on a picture-perfect day. Van Dyken is thrilled people are getting to know her in a far different way than the ultra-competitive person she was as an elite swimmer who became one of the best in the world despite her asthma. “A lot of people didn’t get to see that, they got to see the staring the competitor down, the slapping, the grunting, the spitting,” she said. “So they thought that I was a grumpy grumperson. I love that the world gets to see the real me now. That’s really cool to me. Being the Olympian and the gold medalist helps me get through therapy every day, because there are days that I don’t want to do it. I want to just go home and cuddle with my dog. Her triumphant return Friday was a huge step toward that, “getting back to normalcy.” She has long hoped to impact one person. Now, she knows the numbers who might find inspiration in her story are in the thousands or millions. From the second she came out of surgery last June, Van Dyken planned for this day. It was about two months ago when she began calling her agent again. She was ready. Once Van Dyken said her hellos and got settled, she went to work writing lineups and prepping. She repeatedly clicked a pen with her right thumb, inquiring about the lane configurations and other meet details. While visiting with the producer and director for the broadcast, Van Dyken was as upbeat as ever. Van Dyken had a flight home to Phoenix scheduled later Friday. She knows that’s an exhausting day for an able-bodied person. Van Dyken, who turns 42 on Feb. 15, severed her spine last June in a crash when she and husband, Tom Rouen, who was on his motorcycle, were on their way to dinner. When he found her, she wasn’t breathing, and it took four minutes before she did. Leading up to surgery, they were told to prepare for the worst, because a vertebra was right up against her aorta and with one slip she could be gone. Van Dyken reminds herself to cherish how far she has come after surviving such a frightening ordeal. Bremerton’s Olympic champion Nathan Adrian will have his second opportunity to broadcast a collegiate swimming meet. Adrian, a Cal alum, is part of an Olympic-laden broadcast team for the Pac-12 Championships in Federal Way at the King County Aquatic Center. The Pac-12 Network will air the championships on March 10 (Monday) at 7:30 p.m. pacific time. Adrian joins Rich Burk and Jason Knapp, who will rotate play-by-play. The women’s championships concluded last week as Amy VanDyken and Natalie Coughlin joined Cynthia Potter and Burk in the booth while Adrian did his first live broadcast. The men’s Pac-12 Championships started Wednesday and end Saturday. Prelims are at 11 a.m. and finals are at 6 p.m.